The Interprofessional Clinic at Perley Rideau is now open. An initiative of the Centre for Interprofessional Health Care and Research Network, and established in collaboration with University of Ottawa Health Services, the Clinic offers residents and visitors of all ages a wide range of treatments and services, including audiology, occupational therapy, physiotherapy and speech-language pathology. Services can be accessed through self-referral or a referral from a healthcare professional. 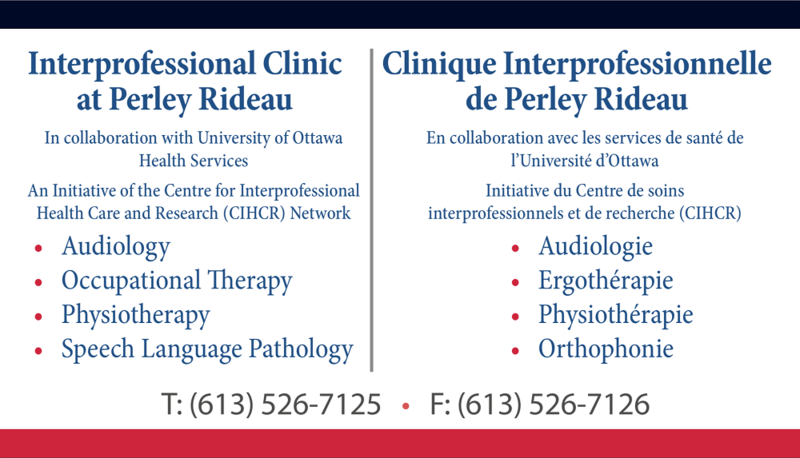 The Interprofessional Clinic at Perley Rideau is a bilingual clinic staffed with skilled clinicians equipped to provide services for adults and children in audiology, occupational therapy, physiotherapy and speech-language pathology. The Interprofessional Clinic is also a teaching clinic, offering numerous student placements for the University of Ottawa. 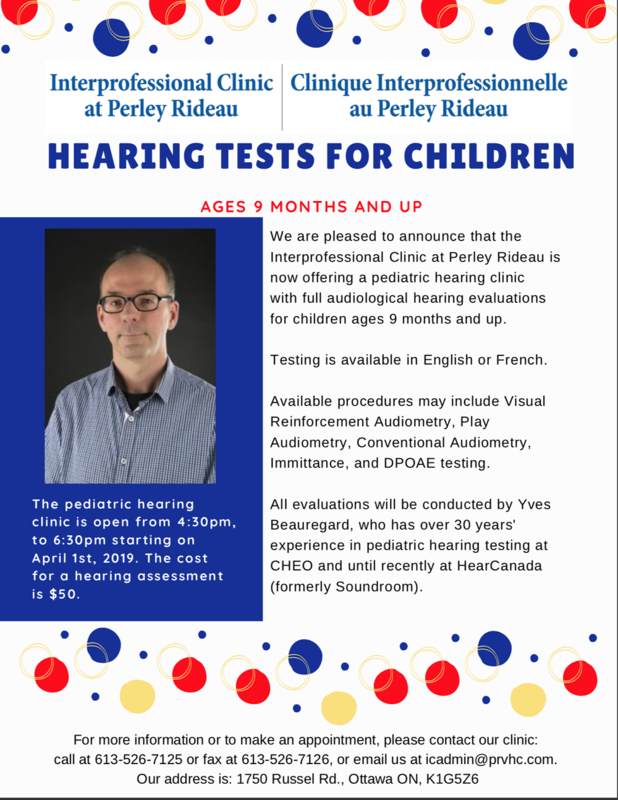 As of April 1, 2019, the Clinic will offer hearing tests to children as young as 9 months. Our pediatric services focus on children presenting with difficulties participating in school (e.g., listening, reading and writing, math, games, sports and leisure, social interactions). All children meeting these criteria can benefit from interprofessional assessments in audiology, occupational therapy, speech-language pathology and physiotherapy (depending on the identified needs), as well as interventions in the required professions. Children 3 years and up that only require a hearing assessment. Typically, only one appointment is necessary. Children 7 and up. The assessment generally includes up to three sessions of approximately 90 minutes each. If needs are identified, intervention sessions are also available. Students and clinicians from the Interprofessional Clinic are to park in the staff parking designations. Clients arriving on-site for treatment services in the Interprofessional Clinic are to park in the designated visitor parking locations.